The State museum of the State cultural centre of Turkmenistan invites those who wishes to visit exhibition named «Neutrality – peaceful development», devoted to the ХХIII anniversary of Neutrality of Turkmenistan, which will be opened on the 7-th of December 2018 at 15:00 . «Neutrality is a value, which favours going ahead confidently, glorifying humane, peace course of our people, opening to all the world a name of the solid people and the powerful state, its advantage». Neutrality is an indestructible support of solidarity and happiness of our people. These days the great value up to world level is given to the neutrality of our state, which promotes peace and stability, friendship and neighbourliness. The successes reached and the subdued heights of the powerful state, which is rapidly going ahead by firm step, amazes today not only our people, but the people all over the world as well. Turkmenistan, which is considered to be the guarantor of peaceful cooperation and development, today is known as the most friendly state. 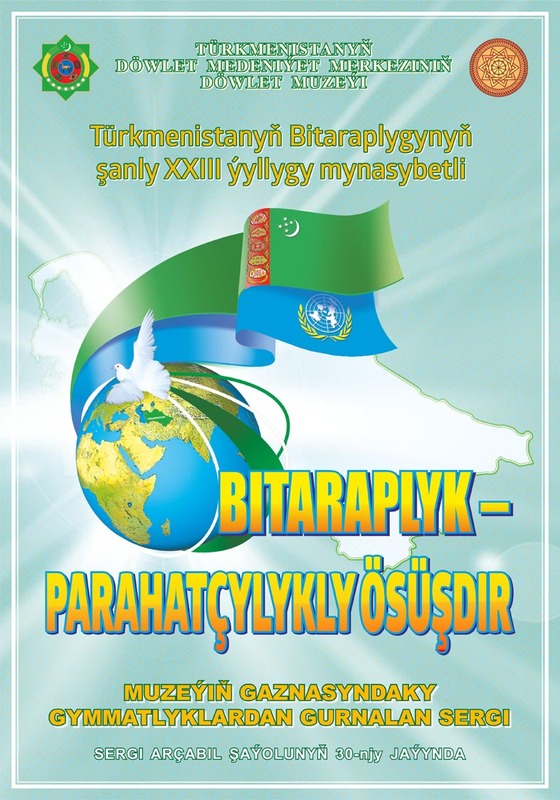 The fact hat 12-th of December is celebrated all over the world as the day of «International Neutrality», has still more strengthened the international authority of our country, because our Motherland – Turkmenistan is the neutral state recognized by the United Nations Organization. In 2018 declared by the honourable President «Turkmenistan – heart of the Great Silk Road», at the State museum of State cultural centre of Turkmenistan is carried out a lot of work. In honour of the ХХIII anniversary of the Neutrality at the State museum of State cultural centre of Turkmenistan is organized an exhibition named «Neutrality-peaceful development». At the exhibition are presented values from the store-houses of the museum, the complete set of photos, where is imprinted our honourable President Gurbanguly Berdymukhamedov during his meetings with the heads of the foreign states and his speech from the tribune of the United Nations. The jewellery compositions, presented to the head of the state, open the main idea of the exhibition. The exhibition is also adorned by the carpets woven by our skilled women, works of artists, books by our honourable President, albums and magazines. In a word, the exhibition named «Neutrality-peaceful development» gives the chance to realize the historical merit of the status of a permanent neutrality of our powerful state in ensure the people problem free and happy life, in protection of peace and law and order in region and all over the world.